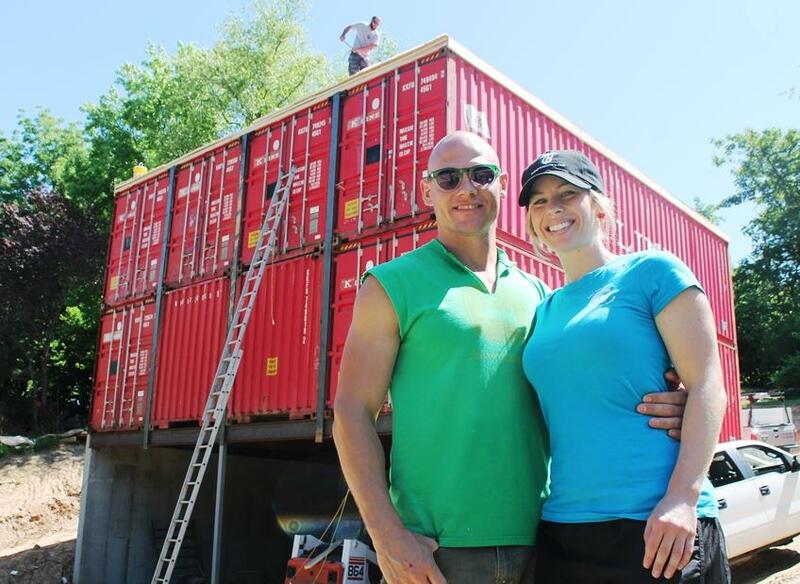 Zack and Brie Smithey in front of the shipping-container home they're building in St. Charles. His sweat equity has helped keep the cost down to $125,000, including the land. They plan to put a wall of windows across the front of the house. Zack Smithey is digging out part of the underside of the house by hand to create a coverered outdoor space. The Smithey's transferred their furniture to one of the containers as they moved out of their old home, before they took the containers to their lot. That way, they wouldn't have to move their belongings twice. 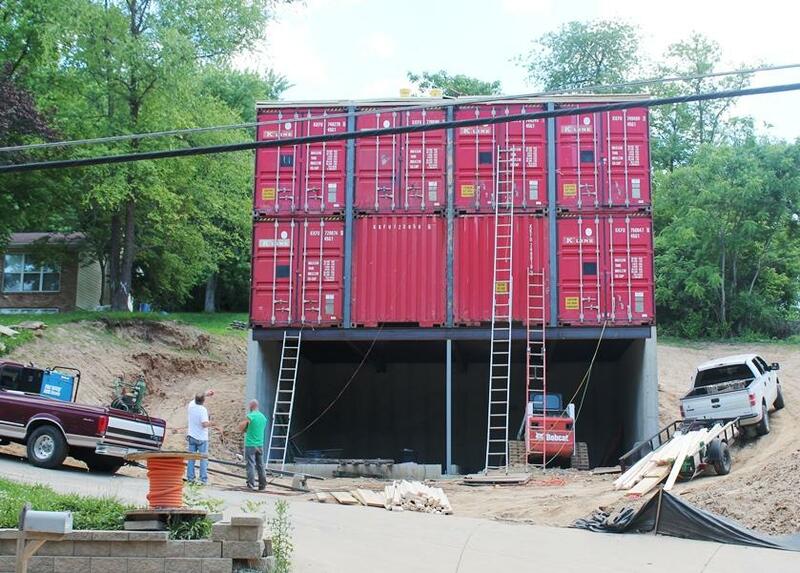 The St. Charles City Council defeated a proposal Tuesday night that would have banned residents from building shipping-container houses in those areas, but the council could revise the ordinance or create a new one. 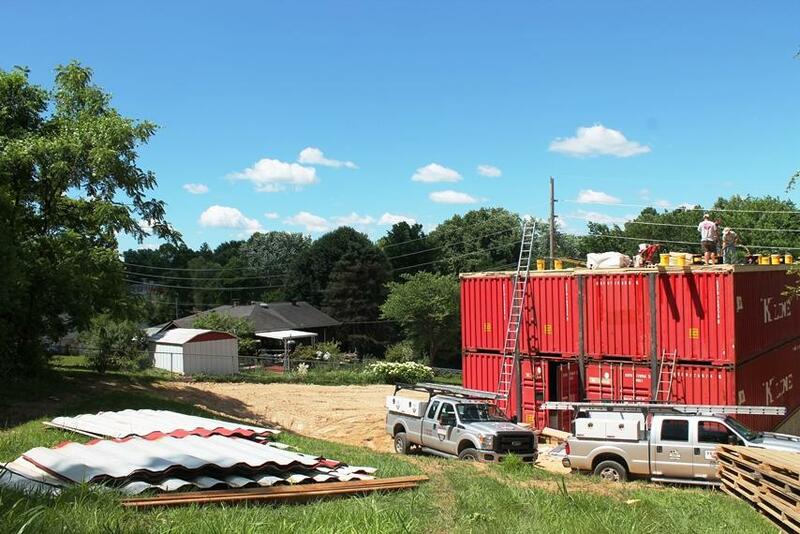 Visit the shipping-container house with St. Louis Public Radio's Nancy Fowler and meet the couple who are building it. The home is being built by Zach Smithey, 33, an artist and a former high-school art teacher. He bought the Elm Street lot years ago and brainstormed a number of other ideas that didn’t work out, including a concrete home and an earth house. 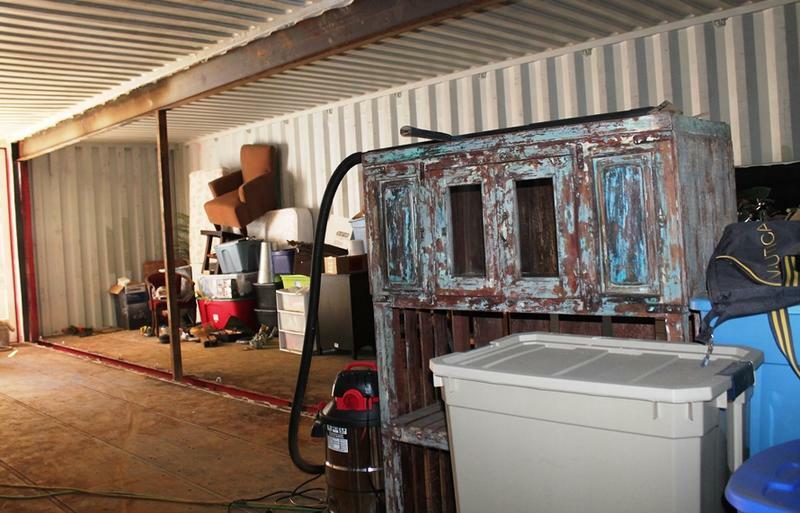 Then, online images of shipping container homes, including one in Kansas City, caught his eye. He decided to wing it, learning as he went along. Smithey removed the first floor walls except for a partial one designed to separate the kitchen and family room area from an office space. He’s cut out most of the 14-gauge steel inside walls, giving an open feel to the 3,000-square-foot building. 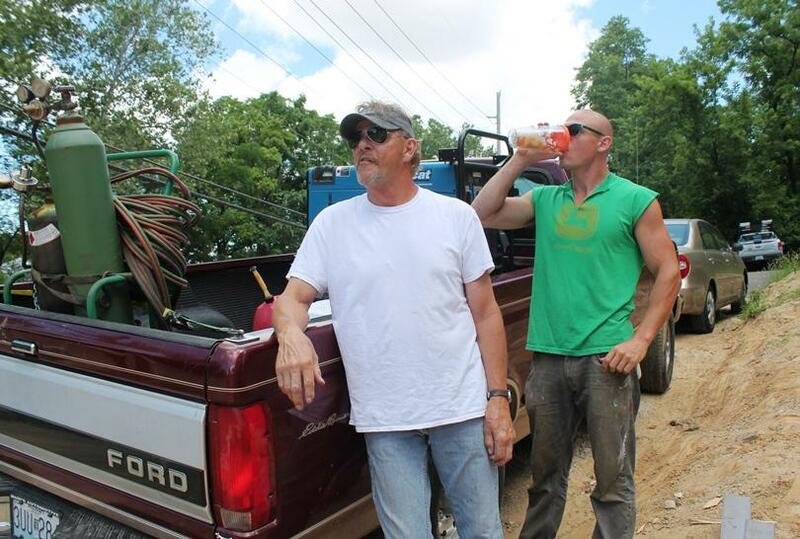 His dad Steve Smithey, a retired iron worker, is often there to help but not in a hands-on role. “[I] mostly just point, and let the boy do it,” Steve Smithey said. Zack Smithey's dad Steve Smithey said he couldn't be prouder of his son's art and this house project. Turns out, building things is a family legacy. Fifty years later, the son of The Arch builder helps his own son use a cutter torch to trim steel straps that hold the containers together. Hardly anything goes to waste. 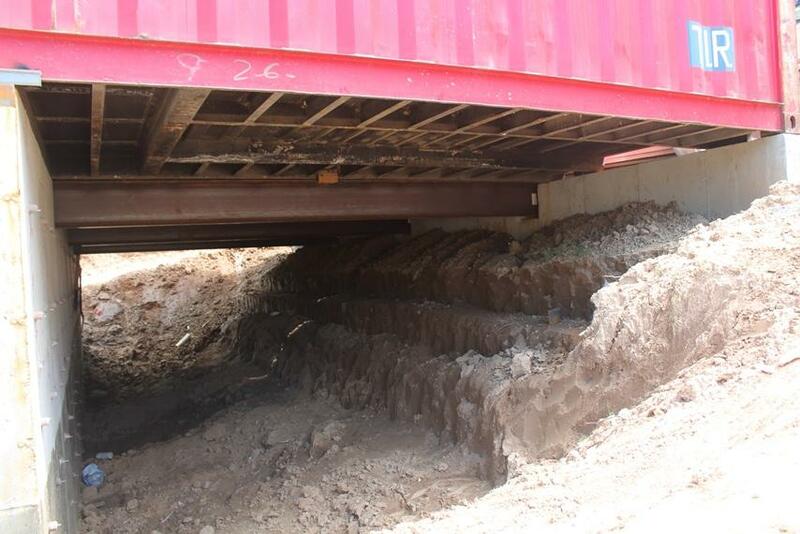 Zack Smithey plans to use steel from the interior walls as fencing. 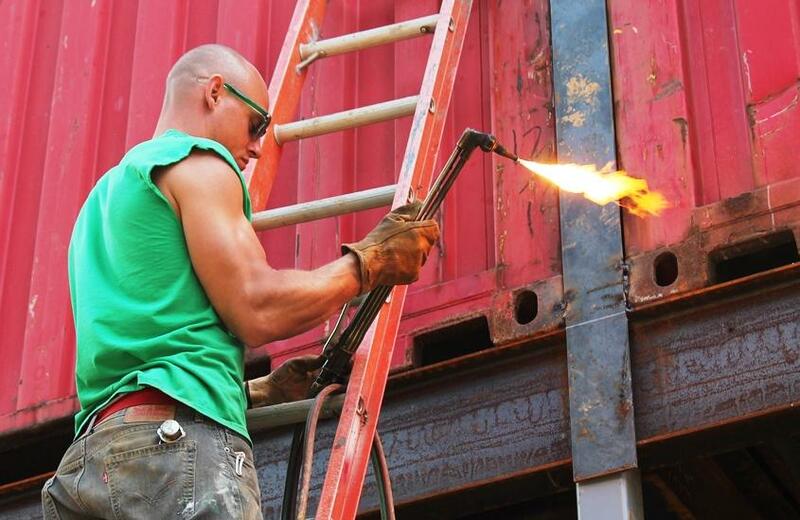 Zack Smithey removes a few inches from metal straps that help keep the containers attached to each other. Most of the materials are recycled — including the shipping containers, which cost $2,000 each — and the windows and fireplace mantels. But Smithy doesn’t store much of that stuff at home but in his 10,000-square-foot art studio. “I’m allowed to horde at my studio, but not our houses," he said. And who made that rule? “My wife, Brie,” Smithey said. 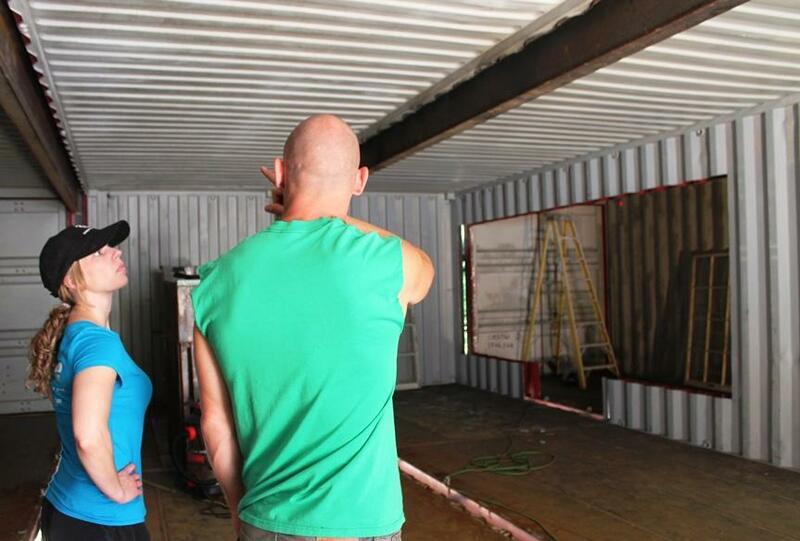 Brie and Zack Smithey check out the progress of the interior. Brie Smithey runs the couple's St. Charles restaurant called Miss Aimee B's. Brie Smithey, 31, said the couple has a policy about differences of opinion. “If we both don’t agree, it doesn’t happen, and we’ll compromise to make it happen,” she said. The Smitheys have been together 15 years, since their days at St. Charles High School, and married for six. This is the fourth house the couple has rehabbed or built, so they’ve had plenty of opportunities to navigate their relationship during stressful times. But that doesn’t mean they’re always on the same page. The Smithey's container home sits in between a ranch and a split-level home. This view is of the back of the house. The Smitheys hope to build a container in-ground pool one day where the aluminum pieces lie on the ground. The Smitheys both think the container house is just the right size — and the right price: $125,000 for the building and the land. But what do the neighbors think? “I think one neighbor called it horrendous,” Brie Smithey said. The house has some admirers, though. People just have to get used to it, mail carrier Debbie Reiling said. Local jogger Kathleen Reineke doesn’t need to wait until it’s finished to know what she thinks. 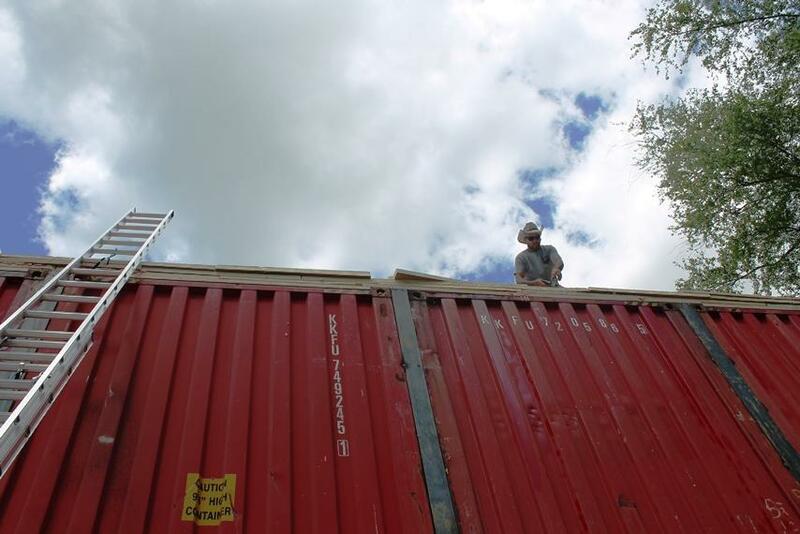 Roofers installed a new flat roof on the container house. 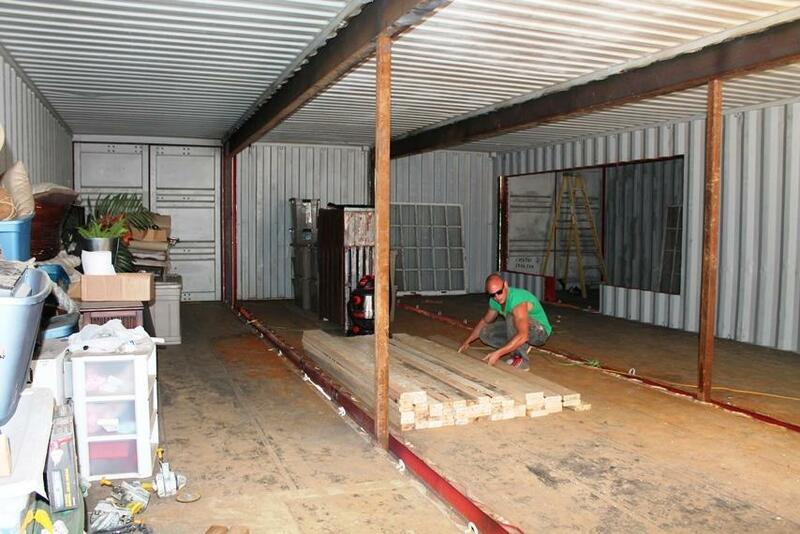 Almost every other material is recycled, including the containers and windows. Smithey dreams of building more such homes, perhaps as a way to help revitalize the city of St. Louis. His container home house poses no special challenges regarding compliance, according to St. Charles code enforcement officer Mike Antram. Although Antram acknowledged the house is controversial, he said a lot of people like it. For them, the word “different" has a positive ring. “It’s an interesting project. 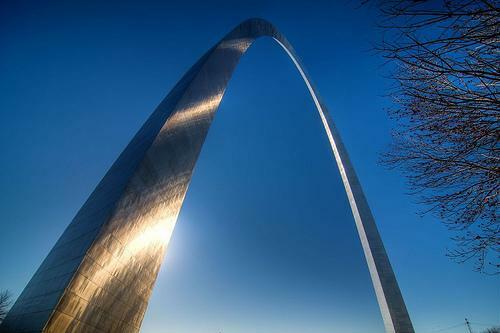 It’s something different here for the city of St. Charles,” people have told him. 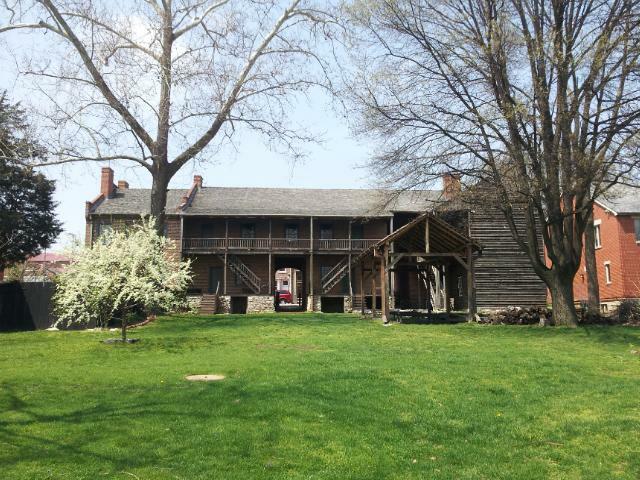 The council's vote on the proposed ordinance won’t affect the Smitheys' house, which they plan to paint a taupe color. They hope to move into with their two dogs in September. Zack Smithey says he not concerned what people think. “It wouldn’t bother me if nobody liked it; it’s my house,” he said. Street view of the container house on Elm Street in St. Charles. Steve and Zack Smithey are standing in front. Original story posted on July 1, 2016. Street art is popping up everywhere in St. Louis. But a fine-art auction house? Street art is hanging out in high places this week in St. Louis. Not just around the top stories of abandoned buildings but in a space known for fine art: an auction house. 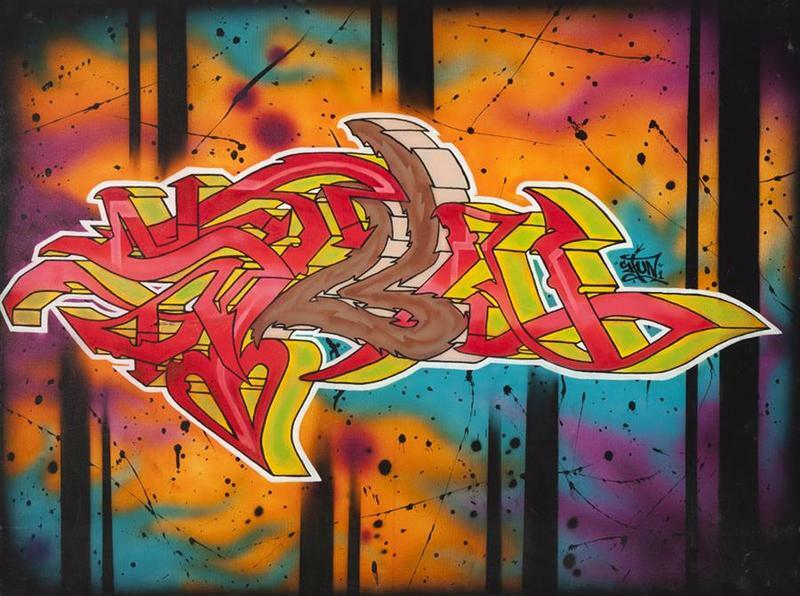 Link Auction Galleries in the Central West End is offering the work of local creatives, along with pieces by nationally known street artists including Banksy and Mr. Brainwash. Discussion: What Makes A Neighborhood A Community? As the population of St. Louis began to shift away from the city’s core in the 1970s, many of the city’s older neighborhoods entered a state of decline. 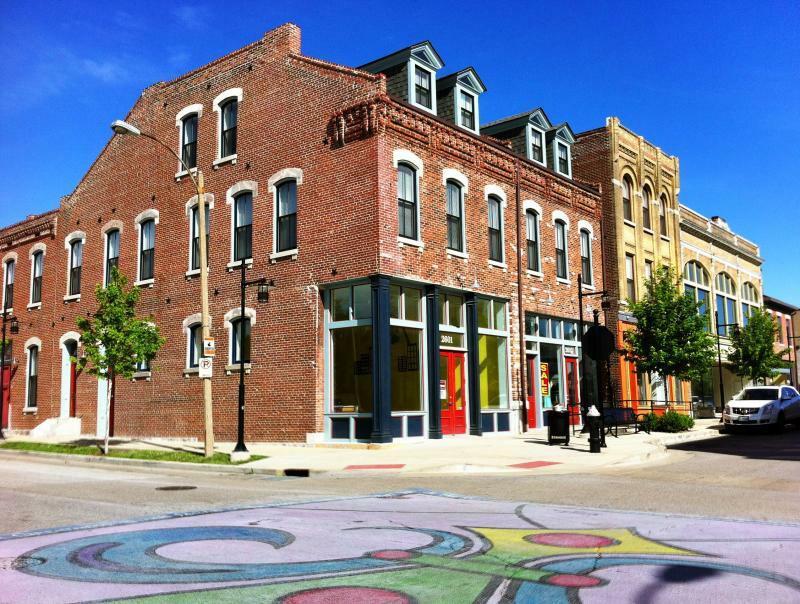 But now, thanks in part to a renewed interest in the city’s older neighborhoods, many are experiencing renewal.